Regional Inequality in Spain Diez-Minguela Alfonso, Martinez-Galarraga Julio, Tirado-Fabregat Daniel A.
Auteurs : Diez-Minguela Alfonso, Martinez-Galarraga Julio, Tirado-Fabregat Daniel A. This book traces regional income inequality in Spain during the transition from a pre-industrial society to a modern economy, using the Spanish case to shed further light on the challenges that emerging economies are facing today. Regional inequality is currently one of the most pressing problems in the European Union, and this text presents a novel dataset covering 150 years to analyse long-run trends in regional per capita GDP. Spatial clustering and a new economic geography approach also contribute to the historical analysis provided, which points to the role played by spatial externalities and their growing relevance over time. To identify the presence of spatial dependence is crucial, not only for getting a better understanding of distribution dynamics, but also for economic policy purposes. What are the potential causes behind the disparities in regional per capita income and productivity? The authors answer this by comparing results with evidence available for other countries, chiefly France, Italy and Portugal, but is of global relevance. 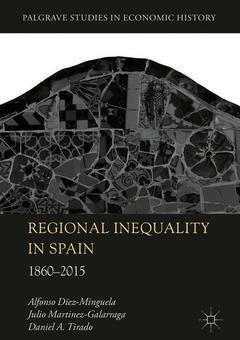 Chapter 1: Why is it Important to Study Regional Economic Inequality?.- Chapter 2: A Potted History: Spain 1860-2015.- Chapter 3: Methodology, Sources and New Evidence.- Chapter 4: Regional Income Inequality in Spain 1860-2015.- Chapter 5: Scratching Beneath the Surface: Distribution Dynamics.- Chapter 6: Spatial Patterns of Regional Income Inequality Then and Now.- Chapter 7: What Explains the Long-term Evolution of Regional Income Inequality in Spain?.- Chapter 8: Spain and its Neighbours: An International Comparison.- Chapter 9: Conclusions. Alfonso Díez-Minguela is Assistant Professor of Economic History at the University of València, Spain. His broad research interests include economic history and economic geography, in particular, the historical roots of economic development. Julio Martinez-Galarraga is Associate Professor of Economic History at the University of València, Spain. His research is focused on the fields of regional economics, economic geography, inequality and education from a historical perspective. Daniel A. Tirado is Professor of Economic History at the University of València, Spain. He has taught undergraduate and graduate courses on growth economics, Spanish economic history, world economic history and globalization at the Universities of València and Barcelona, Spain. His broad research interests include the historical roots of regional economic development and inequality.